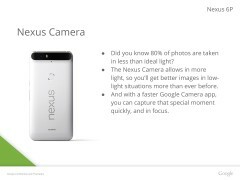 We have seen some pretty detailed leaks regarding the two new Nexus devices in this week that showcased both the front and back design in some fancy press images. 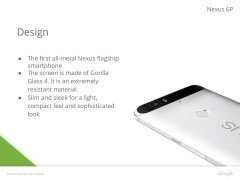 Now, a leaked presentation has surfaced, which goes further and confirms the design and specs of the bigger 6P, along with the four colors it will be sold in. The presentation was designed for internal training purposes. First the specs. 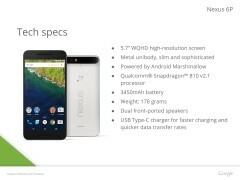 The slides confirm the Nexus 6P will have a 5.7-inch 2560x1440 resolution display (no confirmation on display tech), metal body, Snapdragon 810 v2.1, 3450mAh battery, 178g weight, front stereo speakers, and USB Type-C connector. 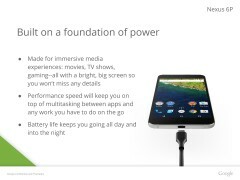 The slide also claims faster charging and transfer rates, so Qualcomm Quick Charge might be on board. 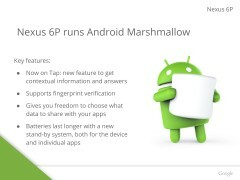 The other slides talk about the improved camera, fingerprint sensor on the back, and Android 6.0 Marshmallow out of the box, which brings with it many features, including Doze that saves battery when the phone is not in use, and app permissions. 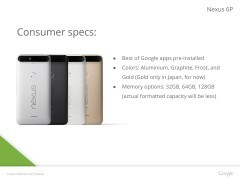 The Nexus 6P will be available in 32GB, 64GB, and 128GB capacities in aluminum, graphite, frost, and gold color options, with the gold color being exclusive to Japan initially. 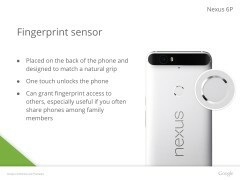 Other than that, we get a good look at the design, including the camera bump at the back, which seen from the side isn't quite severe and only slightly raised. 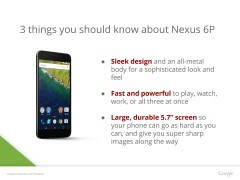 The smaller Nexus 5X also makes an appearance in one of the slides. You can find more images in the source link below.